This weekend I had some of the girls over for a crafting day and we had so much fun. We ate yummy food, drank copious amounts of coffee, and made some cute Christmas decorations. 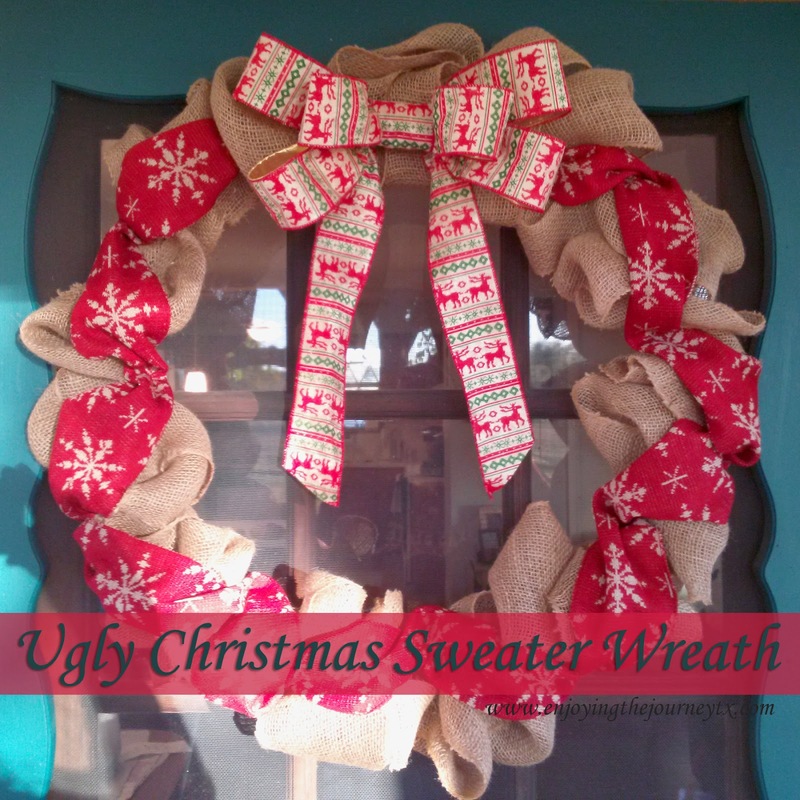 Anna's Ugly Christmas Sweater wreath was my favorite craft of the day and I have included links for tutorials to make one of your own at the end. The morning started with a breakfast casserole that I made in the crock pot and it was super yummy. The night before I cooked the bacon and diced all the vegetables so all I would have to do was get up when my alarm went off and throw the ingredients in and go back to bed for a few more hours. The casserole was super easy and I will probably have to make it again around Christmas time because it was that good. 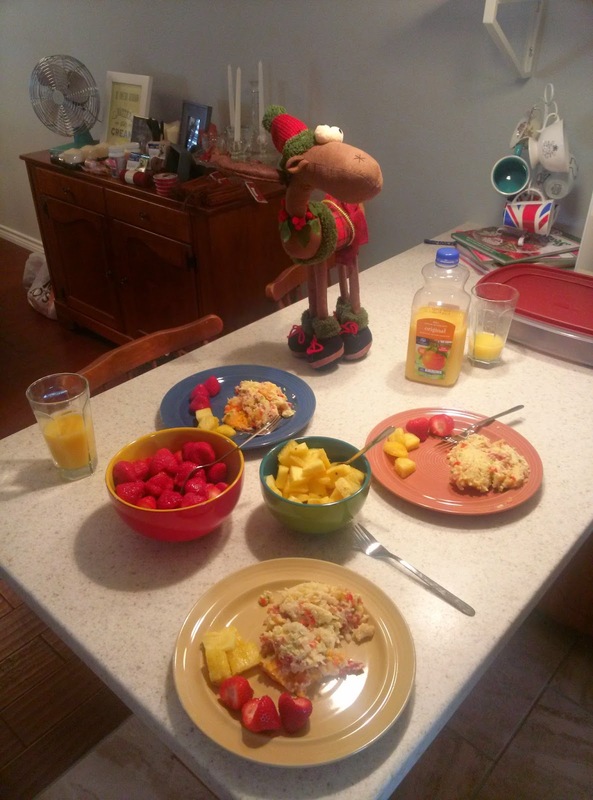 To go along with the casserole I had some amazing pineapple and strawberries and of course some French Press coffee. If you are a coffee fanatic like myself, then you must check out Ekoffee.com. They have the best customer services and don't roast your coffee until you order it. Anna and I enjoyed some Copper Canyon Black Velvet coffee. Seriously, go check them out. After breakfast we began crafting. 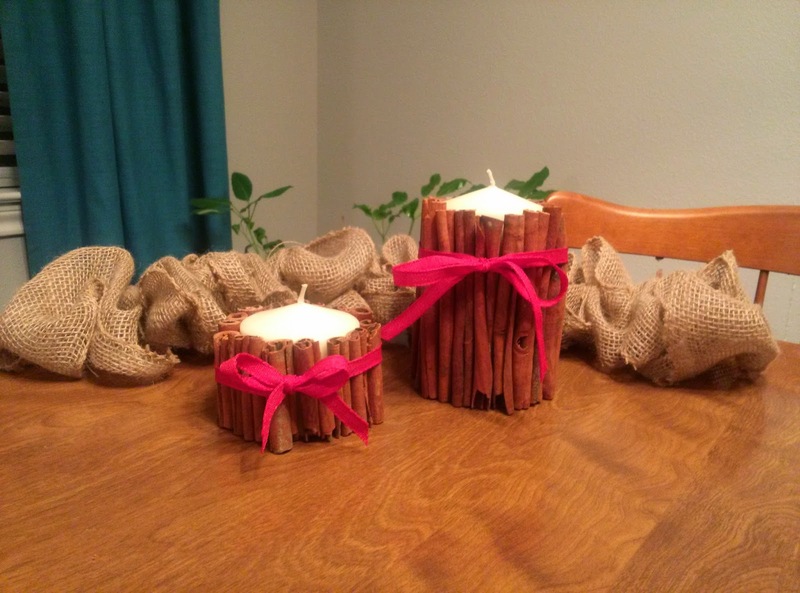 I made cinnamon pillar candles, burlap garland, twine ball ornaments, star stick ornaments, and helped Anna with her Ugly Christmas Sweater Wreath. Overall, each of the crafts were fairly simple to make with a few alterations to the original directions. Cinnamon Pillar Candles: Of course the candles were easy to find, but the cinnamon proved fairly difficult to find. I finally found some at Michael's but had to cut it all down because they were a bit too large. Believe it or not, I had to borrow one of my dad's hack saws to cut them. Be prepared for some 'heavy lifting' if you are going to take this one on. Glitter Twine Ball Ornaments: This was pretty straight froward when we followed the directions. I used a natural twine color for some and maroon twine for the other. I will definitely make more of these for my tree. 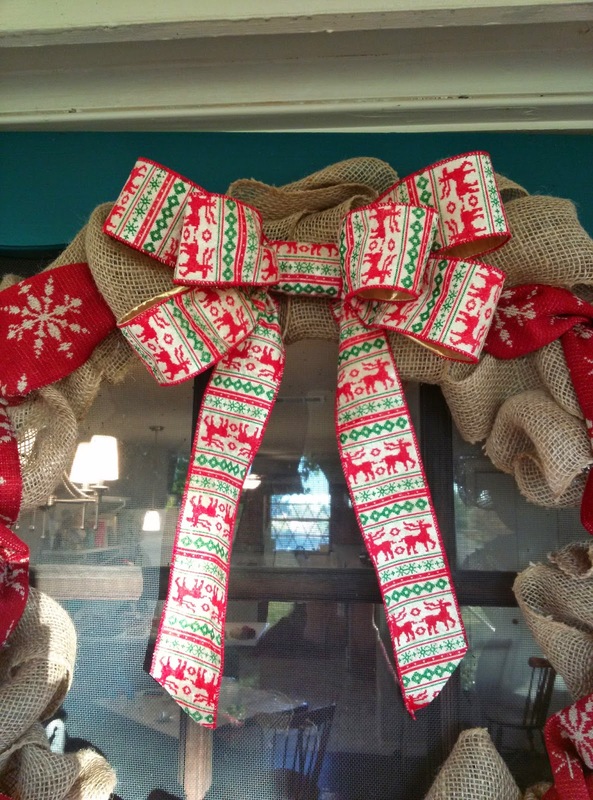 Burlap Garland: This was another one that was fairly simple and easy when following the directions. Keep in mind that you will need a lot of burlap. 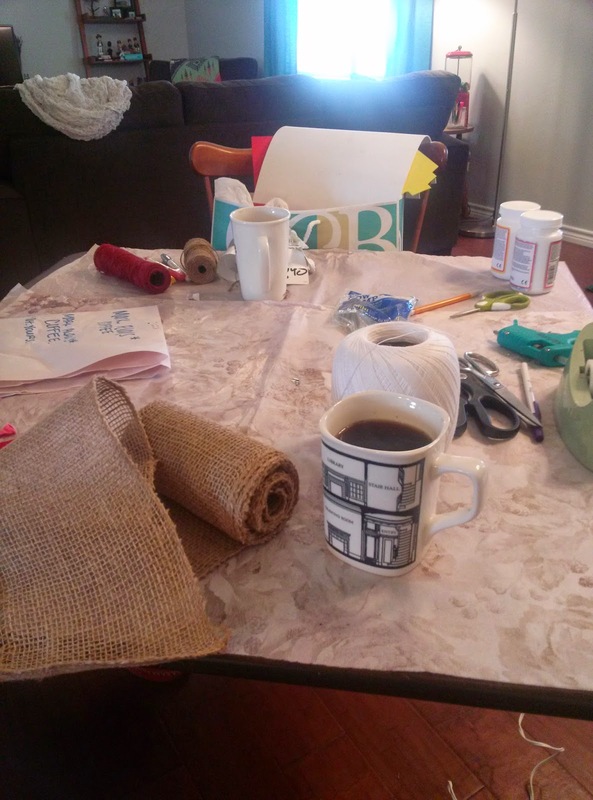 I used the standard roll of burlap that you can get at most craft stores which is 15 feet long. To get a good length that will look good draped on my entertainment center I will need at least thirty more feet. While shopping Anna and I got inspired to make her a wreath after we found some classy ribbon that reminded us of ugly Christmas sweaters. So we did what any self-respecting women would do and we bought some burlap, the largest wire wreath we could find, and some ridiculous ribbon. 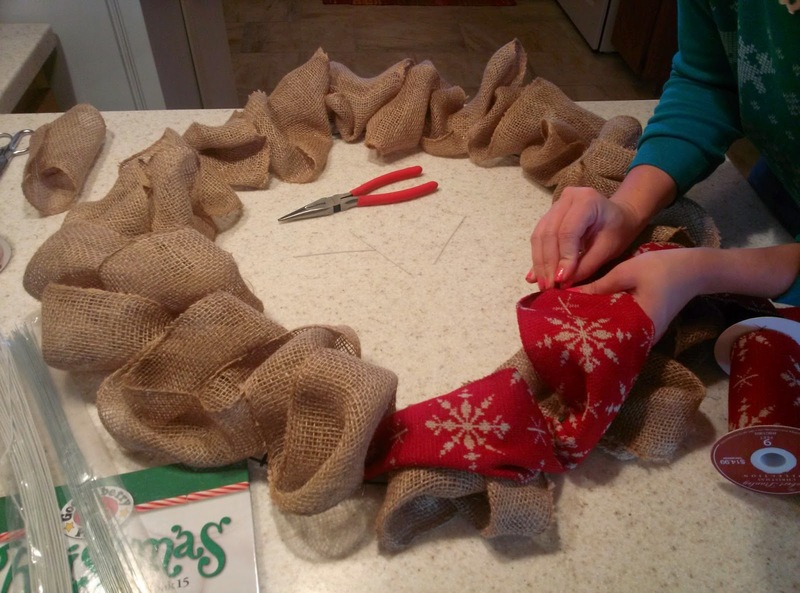 After making a couple of burlap wreaths myself I was able to help Anna with hers, but this is where I found the original tutorial I used. 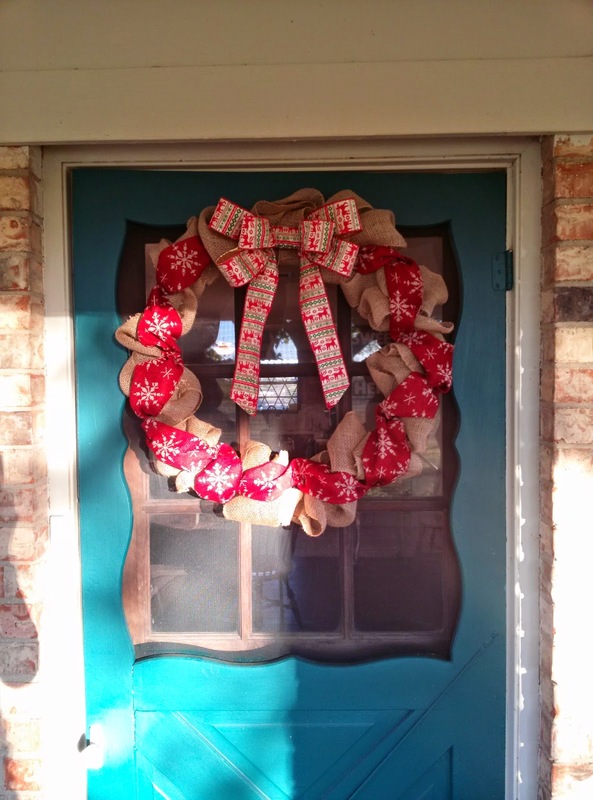 Anna put the two layers on the wreath and then had me make her bow. I modified this bow tutorial by making it bigger and it was so easy since the ribbon had wire in it. We were like little kids while making the wreath and are thrilled with the outcome. Anna even left the rest of the bow ribbon at my house, so now I need to find a use for it. After I finish these few things that I started over the weekend I have a few more crafts I want to tackle before Christmas truly starts. Here are a few on my to do list: Ribbon Star and Christmas Card Hanger. They should be simple, but I'm looking forward to diving into them, as well as a few Christmas gift crafts. What are some crafts that you have on your to do list? Anything I should add to my to do list? So cute! I'm sorry I missed it, looks like y'all had a successful day! You don't have a picture of the twine balls! Everything came out so cute, I'm sorry I had to leave early. What a fun time!! I love that wreath. I have been wanting to make one for a while.